If you are considering the purchase of a Spring Floor for gymnastics, cheer, aerobics or martial arts, there is some basic information you need to know to make sense of the assembly processes and terminology you will find. A great place to start is studying the diagram to the right. 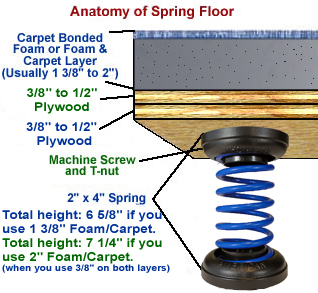 Most spring floors are composed of some combination of four separate parts - Springs (and hardware for attachment), Plywood, Foam and Carpet (or the combination of them). Each of these choices will dramatically affect the price and performance of your floor. There is a difference in Springs generally offered. When you compare flooring systems, be sure you take note of the type of spring you will receive. The American Power Spring™ (at left) is our preference. It features a durable, oil-tempered 2" x 4" coil with plastic retainer caps (top and bottom) that assure vertical alignment. The top and Bottom Caps are identical. We feel that the American Spring's coil has a preferrable coating and the caps have a more robust retention system. It is sold with the t-nut, washer and screw for attachment. The t-nuts are applied to drilled 1/4" holes in the top of the bottom boards. With American Power Springs, the Caps, Springs and Hardware all ship together within a week, if you are getting another brand find out if this is how they will ship and how soon. The top caps are attached to the 3/8" (or 9mm) to 1/2" Baltic Birch Plywood with a washer and screw secured into the t-nut. The Springs fit snugly in the caps that are attached to the boards. The Spring's bottom caps are put in place - these sit directly on the concrete. There is generally one spring per square foot. Some vendors offer floors with foam blocks instead of springs, or a combination of both. Remember that foam block will wear out (lose its height) far quicker over time under that constant weight, than springs. So, for longevity, consider springs. Attached to this (usually with hook and loop fasteners) is the top layer - generally 3/8" (or 9mm) Baltic Birch. These two layers are staggered so that your floor's response is uniform. The wood part of your floor is not always sold with kits, so be sure you know what you are getting. The wood decking is the most important aspect in the life expectancy and performance of your floor. If you like, you can purchase your wood from a local lumber yard (i.e., Home Depot, Lowe's, 84 Lumber, etc. ), but beware. The quality, thickness and type of wood do make a tremendous difference. Most suppliers of quality spring floors are using the Baltic Birch (sometimes called Russian Birch). A 1/2" Fir Plywood can be used if you have difficulty finding the birch. OSB (Oriented Strand Board) tends to break more easily - especially in the thinner dimensions required to be able to engage the springs. You may contact a local cabinet manufacturer who may be able to obtain the Baltic Birch. It will provide superior strength and longevity for your floor. If you opt to go thicker it will become less likely that the springs are engaged during activity - especially for lighter tumblers. You can purchase an Assembled Spring Floor, like those sold here, where the springs are already mounted on the optimal wood for spring floors. Some manufacturers offer floors in 4' x 8' panels, but most of the leaders in the field have gone to 5' x 5' panels, as we have. They are much easier to ship and handle. Of course, some of the panels will need to be cut to make any given size of floor. This we do for you. So you just have to set them down in sequence in your facility - no tools are needed. You then cover the decking with foam and carpet. There are two routes to choose from here. You can get the Foam separately and then purchase carpet to place over it. The much less expensive and simplest route is to get what is known as Carpet Bonded Foam (or Flexi-Rolls®). This is a carpet that is flame laminated to (usually) a Trocellen Foam making the top two layers one piece (see right). It is a remarkably durable product. Learn more about Carpet Bonded Foam or Flexi-Rolls®. They are currently available in eight colors. This is by far the most common spring floor covering in the US today. Many gyms and schools use it without a spring floor as well. It normally comes in 1 3/8" or 2" thicknesses. EVA Enhanced versions of these rolls are also available. If you go the route of foam and separate carpet, this is a more expensive way but makes for a more beautiful floor. The foam (usually Trocellen) is available in the same 1 1/4" or 1 7/8" thicknesses. There is also a EVA Enhanced Trocellen which is more expensive but has a better response. It usually comes in 1.5" or 2" thicknesses. There are many different colors of carpet available. The most readily available and least expensive is Royal Blue. The carpet is shipped in usually 3 or 4 segments (depending on the size of your floor). You will need the velcro belts to attach to the carpet segments. These join the segments under the carpet. If you choose the foam with a separate carpet option, tapered foam borders are an option for completing your floor. They allow a gradual transition to floor level (see right). Usually the angled border extends about 12" from the decking. This is the sharpest (and most expensive) of your options. This is top-of-the-line and is what you will see at all the major gymnastics competitions. 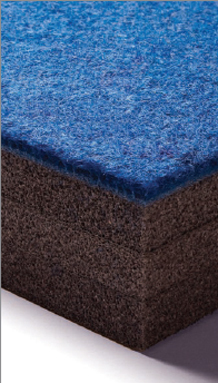 If you top off your floor with Carpet Bonded Foam, there is Angled Borders available for this also. See the Border Option page. If you are leaning toward going Carpet Bonded Foam or Flexi-Rolls® to top-off your floor, you may consider using a Vinyl Floor Skirting. This product velcros to the top of your CBF around the perimeter and hangs to the floor, hiding the wood, springs, etc. and providing a nicer look. This is used to enhance the safety and appearance of the floor (no exposed wood or springs). It also prevents things from rolling under the flooring and prevents "dust bunny" habitats. Another option is Angled Carpet Bonded Border. You can check out this and other options on our Borders page. When you are shopping for a spring floor, read carefully what the provider offers. Some "Kits" come with just the springs or springs and velcro. Others will be wood, spring and hook and loop fasteners - but you will need to cut, drill and attach the springs. Dependent on size, a standard (42' x 42') spring floor will assemble in approximately 60 hours with instructions geared towards the booster club production line (this depends largely on how many workers you have). The most responsive Spring Floor are assembled layer to layer with velcro. This adds considerably to the time it takes to complete construction, but improves the uniformity of rebound and makes it far easier to move should that become necessary. To learn more about building your own floor, visit our Kits page. If you get an Assembled Spring Floor, you can cut the installation time to just an hour or so (depending on the size you choose). You also are assured that it is done right and is (in most cases) covered by a warranty. We think this is the way to go. A single layer floor will usually be made with 5/8 - 3/4" thick plywood and use H-channels and straps to lock the boards together. This floor is simple to take up and down, but the H-channels must follow a specific layout. Channels tend to move around, which is the downside. As a result, you will end up with soft spots over time as they shift out of place. Additionally, the straps can stretch and allow the floorboards to slowly shift. A single layer spring floor will not stay square over a period of time and gaps may form. Every so often, you may have to adjust the floor system and tighten the straps. For flooring system, we recommend and provide are a dual layer 3/8" (or 9mm) Baltic (or Russian) Birch. (The American Gym is the largest single user of this material in the United States.) We have found that it provides a lively, fast reliable and durable floor for tumblers from 60 to 200+ pounds. This also creates happy coaches. OSB, we have found, is a good product but does not supply the longevity of Baltic Birch and tends to break easily under the pressures your floor will encounter. We will be glad to furnish you with a price for your floor (or strip). Just let us know what you have in mind. We can produce any size. Just remember that the foam product required usually comes in 6' widths. So, you might want to keep one dimension divisible by 6 feet, if possible. All spring floors are not created equal. Though many manufacturers use the same or similar materials, the difference can be dramatic. Click here to see how we supply Assembled Spring Floors!